Details regarding the current version of the MIL-STD-461 Revision G, as well as Revisions E and F can be found on the main MIL-STD-461 page. This page contains details of the previous revisions of the MIL-STD-461 document. Much of the testing specified in the standards listed in the tables below is derived from the A, B and C versions of MIL-STD-461. While there is a fair amount of redundancy, recognizing the subtle differences between the different versions of 461 and its derivative standards is important as it will impact the cost of the testing as well as the degree of difficulty in complying. MIL-STD-462 CE01, CE02, CE03, CE04, CE06, CE07, CS01, CS02, CS03, CS04, CS05, CS06, RE01, RE02, RE03, RE04, RS01, RS02, RS03 First published in 1967 to provide a joint specification for the Army, Navy and Air Force, MIL-STD-461A is still referenced today. Updated in 1980 as 461B and again in 1986 as 461C, changes included an expanded scope as well as modifications to the limits originally defined in the A-version. MIL-STD-462 defines the test methods used and all documents have numerous notices. MIL-STD-462D CE101, CE102, CE106, CS101, CS103, CS104, CS105, CS109, CS114, CS115, CS116, RE101, RE102, RE103, RS101, RS103, RS105 Published in 1993, 461D was a first step towards harmonizing the MIL-STD and commercial test methods. Significant improvements included defining measurement bandwidths for emission testing and scan rates/step sizes & dwell times for immunity testing. Test methods are defined in 462D. MIL-STD-461E CE101, CE102, CE106, CS101, CS103, CS104, CS105, CS109, CS114, CS115, CS116, RE101, RE102, RE103, RS101, RS103, RS105 While subtle changes were made from the D-version, the most radical change was integrating the limits and test methods into one document. Similar to 461D, this document was published with an application guide which gives an historical perspective on the reasons for the various tests and helps to clarify the methods used in this testing. Until the publication of 461E, MIL-STD-461 documented the test limits and levels while MIL-STD-462 specified the test methods & procedures that were to be used for conducting the tests. The E version of this standard combined both into one document. This standard provides an interesting read from a historical perspective because it specifies the requirements for some of the antennas that should be used for the testing. Figures 2B and 2C refer to the “outrigger” elements for what is more commonly known today as the biconical antenna. *limited applicability – applies to antenna ports only. Although this standard is not often used anymore, it can still be called out when a part that was originally qualified more than 25 years ago is replaced with new hardware. The rationale behind this is that if it worked for hardware that was previously qualified, it will work for the replacement hardware. One of the most important aspects of this standard that one should be aware of is the extremely stringent limit for CE01 and CE03, conducted emissions on power leads. 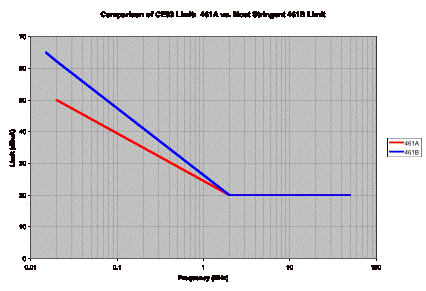 The chart below compares the CE03 narrowband curve for 461A to the most stringent CE03 limit in 461B. Although both curves specify 20 dBuA (10 uA) of current from 2-50 MHz, the A-version is more stringent at lower frequencies where low-order harmonics of switched mode power supplies (SMPSs) are likely to reside. This would clearly impact the front-end filter design of a SMPS. Published in 1980, this standard stream-lined the requirements by combining CE02 with CE01 and CE04 with CE03, and deleting RE04. One notable addition to this standard was the A2a classification for “Spacecraft and Launch Vehicles (including associated ground support equipment)”. Another was the addition of the CE07 test, which specifies limits for the magnitude of power bus sag seen on an input power bus due to turn-on and the (back EMF) surge as a result of turn-off. One can also see the increase in bandwidth in a number of the tests, most notably RS03 up to 40 GHz. Published only six years after MIL-STD-461B, this standard was very similar to the B-version. Notable among the changes made were a much more clear delineation between types of equipment being tested – each equipment type has its own part. Also, this version added the damped sinusoidal testing of CS10 and CS11 as well as the RS05 requirement for electromagnetic pulse (EMP) field transient. The D-version of MIL-STD-461 was a major overhaul of this standard. Both test levels and test methods were significantly changed, requiring an update to MIL-STD-462 as well. Other than the notices which amended 462, this was the first major update to -462 since its initial publication in 1967. So drastic a change was 461D that it changed all the test designators. CE01 became CE101, CE03 became CE102, etc. This allowed one to easily recognize that the new standard was being specified for a given program. One of the more significant changes in 461D was replacing the 10 uF feedthrough capacitors with Line Impedance Stabilization Networks (LISNs). This change was implemented for all test setups, but the most significant impact it had was on the CE102 measurement. Conducted emissions on power leads had previously been performed using a clamp-on current probe and the measurement was taken in terms of dB above one microamp. (The current probe technique is still used for CE101.) However, CE102 changes this measurement to one more similar to the commercial test method; namely, a voltage measurement taken off a coaxial port on the LISN. Another change that was made to 461D version which was a significant improvement was specifying minimum sweep time requirements for both emissions and susceptibility testing. Especially on susceptibility testing, this was a glaring hole in the previous standards. 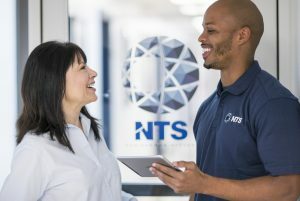 By defining minimum requirements for sweep times (and also giving test labs the latitude to perform a step and dwell routine), the standards greatly reduced the possibility that susceptibility problems could be missed during testing. Better definition in the standard also helped to ensure greater repeatability from lab to lab. Next was the addition of making a pre-test calibration part of the test procedure. When testing to the previous standards, one could go through an entire test suite with a faulty cable and never know it. This cable could adversely affect the results for one or many tests, depending on how often it was used. Performing a pre-test calibration is an excellent check to ensure that cables and connectors are in good condition, the correct transducer factors have been entered (with the correct signs! ), and that all equipment is functioning within its required parameters to ensure that test results are within 3 dB of the intended level. Finally was the abolition of narrowband and broadband measurements. 461D made no distinction between the two. Instead, it specified a single emission limit that should be used and specified the measurement bandwidth of the receiver. This was given as a function of frequency. 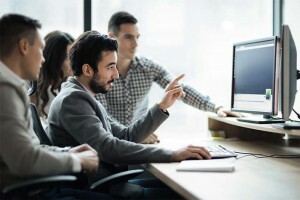 This change was also a significant step in the direction of the commercial standards and eliminated what had been a controversial and ambiguous part of the previous standards. One aspect of EMI testing for MIL-STD that has become much more prevalent in the past 15 years or so, has been tailoring of a given test standard to better reflect the anticipated environment that will be seen on a specific platform. While this option is given to procuring agencies in versions B through D, it didn’t really catch on across the board until the publication of the D-version. While tailoring is more prevalent in the aerospace community, it may be seen in military procurement as well. The consequence of this is the following admonition: just because procurement specifies a particular MIL-STD requirement does not necessarily mean that you have to meet the published requirement. The requirement may have been relaxed in some areas and, more important, it may have made more stringent in others. Not reviewing the requirements carefully can result in a serious underbid of procurement.